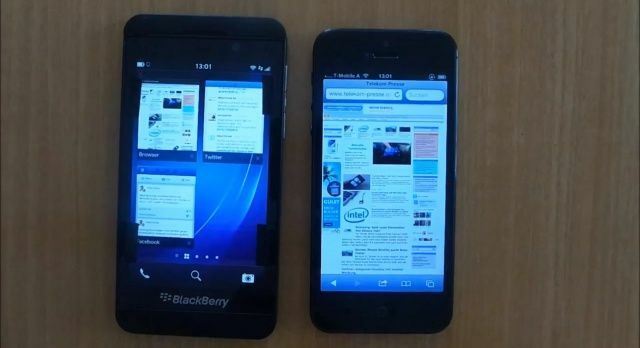 You may have noticed that people are making a lot fuss about Research in Motion’s upcoming BlackBerry 10 devices. And so they should. BlackBerry fans have been waiting for these handsets for several years, and they have high hopes for them. Furthermore, the devices are likely to determine whether or not RIM can save itself amid increasing competition from the iPhone and Android-powered devices. The first BB10 devices won’t get their official unveiling until later this month, but numerous handsets have already found their way out into the wild. In the video below, a leaked BlackBerry Z10 goes up against the iPhone 5 in a comparison against size and form factor, as well as features. As you can see, the iPhone 5 is slightly thinner, and it has a more premium look and feel; there’s no plastic in sight. Having said that, I quite like the look of the BlackBerry Z10, too. The display’s a nice size — it’s not too big — and RIM appears to have kept the design as simple as possible. In a simple voice control test, the Z10 was faster and more accurate at sending at text message. It’s also better at multitasking, offering users a live preview of active apps, rather than just displaying their icons. As for the home screens, there isn’t too much difference between them; like iOS, BB10 displays icons with names underneath. It also has a nice animation when scrolling between home screens, not too dissimilar to Android’s. Of course, the Z10 and its software in this video may not be final versions, so we’ll reserve our judgement of it until RIM makes everything official. However, I think it’s safe to say BB10 looks like a huge improvement over its predecessors.